WE GOT IT!!! On Wednesday and we watched it 4 times!!!!!!!!!! You did an awesome job at the editing. It turned out EXACTLY the way I envisioned it, if not better. The menu is gorgeous, you managed to incorporate everything!!! Initially, I did not intend to have a videographer, not only because of cost, but I had felt it might have been redundant having a photographer and videographer. 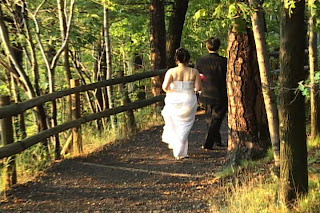 In hindsight, I would have totally regretted it if I had not had a videographer. Your wedding flys by so fast and because the bride and groom are in the midst of it all, there's so much that you don't get to see. You sometimes don't have the time to stop and enjoy what's going on around you. 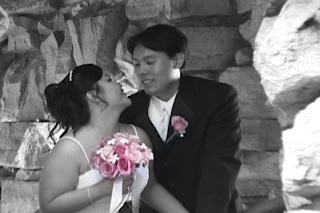 We were reminded how fun and great a time we had at our wedding when we watch our wedding video. Thank you so much for capturing our special day in such a perfect way! Your work is so addictive, we couldn't stop watching! You're personalities are so lovable and the two of you are a great team! We could not have asked for better videographers. We are so lucky to have found you two to capture our special day! I am sooo in love with your work that I've become a walking advertisement for your business. Seriously, I can't stop watching the video. I love how you made it soooooo personal to me and completely incorporated everything I envisioned. I love the way you did the credits!! And using all the pages of my guestbook, as well as the quotes in them! FANTASTIC! !